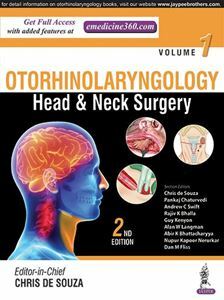 Otorhinolaryngology—Head & Neck Surgery in its second edition has included an Otology Section. This book is authored by all the who's who in Otology and it retains its flavor of being clear, concise and comprehensive and includes updated information. Its table of contents takes the reader right from the basics all the way to advanced treatment modalities. This book is authored by all the respected luminaries in the field. It is very well illustrated and contains color illustrations that are beautiful, and as is often quoted, "A picture is worth a thousand words". It benefits the novice as well as the experienced head and neck surgeons by covering all the areas in this ever-expanding field. Chapter 75 to Chapter 166 available in Volume 2.